This week it was officially decided that new buses will be ordered for the XL route, targeted to enter service from September. 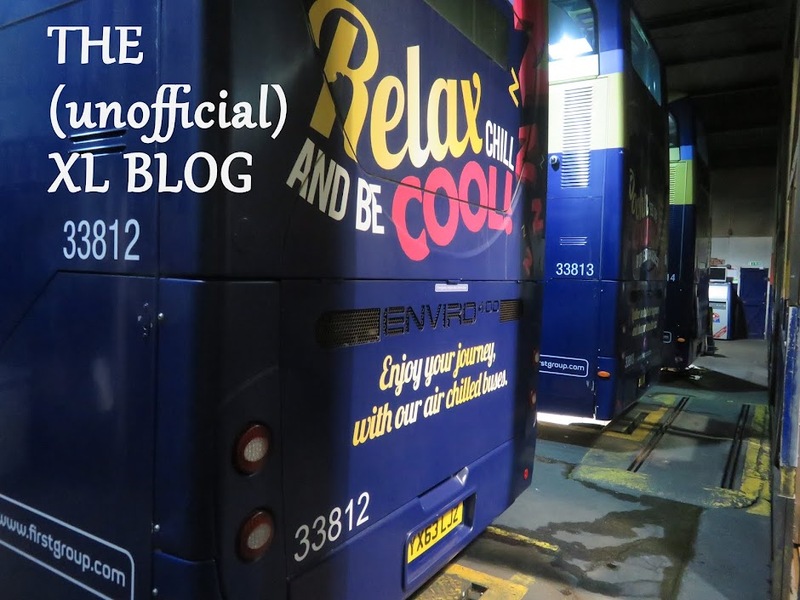 The existing fleet of Enviro 400s have already gone a year beyond there original expected replacement date and in fact there were discussions as to whether they could remain on the route until 2021, however, new vehicles was the preferred option. I am told the Enviro 400 body will be retained in the new build but Scania engines will be fitted if space constraints can be overcome. It is thought that the blue Excel livery will be discontinued and the new vehicles will revert to a white livery and be fitted with seat belts. Can I really have been doing this blog for X years and never have posted a picture taken at Thorney Toll ? Well apparently yes, so to redress the balance here is 33816 on Sunday 17th February passing the outpost working the 10.10 Norwich to Peterborough. Out on the road, the most notable event so far this year has been the reliability of 33806. In what is possibly a record for the fleet, this bus managed 46 continuous days in traffic between 2nd January and 16th February. After a day off resting in Norwich on Sunday 17th, the bus returned to work on the 18th and has been out every day since. This remarkable statistic is all the more unusual in that buses requiring safety services are often off the road for an entire day and 33806 has managed to undergo these and still spend part of the days in question in traffic. The other factor which means this sort of thing is uncommon is that on Sundays there are only seven XL diagrams, so by the law of averages it is rare to get a bus in use for six consecutive Sundays, a feat which 33806 managed ! After all the excitement with Gemini substitutions in January, there were none whatsoever in February. MOTs have continued with 33805 and 33813 being dealt with. 33807 photographed by Zak Nelson before it misbehaved, here it is working through the frost at Easton on 31st January. Unscheduled stoppages have been scarce in February, though on the evening of 21st, 33807 was taken out of service smoking badly and after diagnosis it was decided that it needs a new engine. It was still at King's Lynn at the end of the month awaiting transfer to Norwich where the replacement engine will be fitted. This coincided with MOT preparation on 33813 meaning that normally a Norwich based Gemini would be called upon to act as a spare maintenance changeover bus, however, a backlog of maintenance at Norwich meant this was not possible, so it was fortunate that no breakdowns were recorded in this period. Other issues have involved 33811 (axle) and 33812 (gear selector). In fact the only hiccup during the lack of spare buses was down to staffing issues when on Monday 25th, no driver was available to work the 07.30 King's Lynn - Peterborough and this and its return working as far as Lynn were cancelled. I had two texts from friends, one of whom was waiting at King's Lynn South Gates and the other at Walsoken Lynn Road for this bus, I'm sure they think I am personally responsible !! It is in fact an extremely rare occurrence and on average happens just once a year, but there you are. Timekeeping has been good during February which of course in the last week included temperatures more akin to Summer than Winter ! Low points were on Tuesday 12th when the 09.10 Peterborough - Norwich with 33811 was 23 late into Wisbech - the delay was remedied by replacing it with 33807 at King's Lynn which departed on time. On the afternoon of Thursday 21st an incident on Guyhirn bank saw services diverted via Wisbech St. Mary commencing westbound with the 14.40 departure from Wisbech. Finally on 26th 33814 on the 08.00 King's Lynn - Peterborough ran via Terrington and Walpole instead of the A47 due to an obstruction. All in all another good month for the relaxed timetable ! Well wouldn't you know it, you wait almost eleven years for a picture at Thorney Toll and then two come along at once ! Well having seen 33816 earlier, it would have been rude not to take advantage of snapping 33817 heading east on Sunday 17th February.